Tahlequah was established in 1839 and is known as the capital of Cherokee Nation. It has a population of 17,000 and is home to lakes, rivers, creeks and beautiful landscape nestled in the foothills of the Ozark Mountains. It is just over an hour drive from Tulsa Oklahoma and attracts many visitors to our local university. 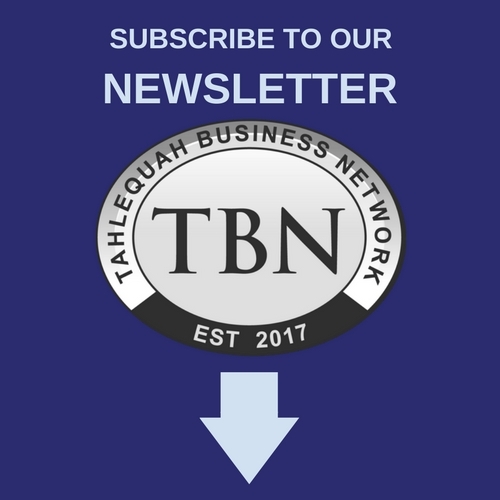 If you’re in business in the Tahlequah Oklahoma area and just cannot find enough like minded entrepreneurs or business owners to connect with, then Tahlequah Business Network can help you tremendously. We understand the daily grind and mental struggle of running, maintaining and scaling a business, therefore, many of us would like the type of support that will encourage us to improve, learn and grow in our local economy. We meet regularly to learn, strategize and network in order to support each others’ business and develop relationships that not only sustain our region, but also provide more business opportunities. Tahlequah Business Network would like to host periodic educational sessions geared towards the small business owner. In these presentations you will hear from various speakers from all walks of life and in all arenas of the business world. The purpose is to support each other, unite each other and educate in ways that are relevant to our local businesses. Our memberships are limited due to restrictive seating and meeting locations. There is a non discriminatory vetting process that we all go through in order to become a member. We believe that all of our members should benefit from this opportunity to network and grow with a local public meeting group like TBN. Krista has been one of our most active and engaged members from the moment she joined. She has a contagious passion for Tahlequah and it’s business community and has done so much for our organization, including pioneering our Events Committee! Thank you Krista Wheeler for supporting TBN and creating such a wonderful montessori school for the Tahlequah community!